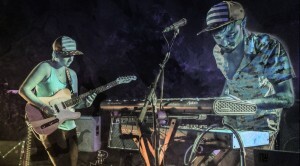 By walking the fine line between synthpop and alternative rock, Cat Has Claws staked their claim to being one of the most talented acts in Providence’s music scene. Julie Bozek has stunning skills on electric guitar while the sonic tones of Matt Hebert on synth and keyboards are fantastic; their dual harmonies make them shine and the lyrics get stuck in your head. The duo’s latest EP, Oh Well, is a continuation of that unique style. They’ll be ringing in the release of it at Dusk in PVD on Nov 16 with new wave stalwarts Triangle Forest, garage punk up and comers Super Natural II and indie rock groovemeisters Thug Honey joining in on the fun. Before the show, I had a chat with both Bozek and Hebert about the slight changes in the new release, writing music in small batches, the band’s Attleboro roots and plans for a tour next year. Rob Duguay (Motif): The new EP has the both of you embracing the synth side of Cat Has Claws’ sound more than in past releases. There’s also a bit of difference in the production quality as well. Where was it recorded and what do you think was vital in capturing the particular vibe Oh Well has? Matt Hebert: We recorded it in our apartment in my own studio. For our last EP, we went and did it at Wooly Mammoth Sound in Boston and we really enjoyed the experience we had, but, in order to capture the essence of us, I wanted to get back to us doing self-recordings and being able to take our time with it. We took eight months to make sure we got everything the way we wanted it, and it gave us the ability to tweak things, especially the synth sounds, a lot more as the songs built up in layers and we could go back in and adjust and change stuff rather than doing something on the fly. Depending on the song, I would adjust drum tracks, synthesizer tracks and keyboard tracks as we went along. RD: You can definitely notice the tweaking versus your past releases. Cat Has Claws’ discography is all EPs so far: Do you plan on keeping it that way for the future or will there be a release of a full-length album eventually? MH: Right now, EPs work for us because it’s quicker to go through it and our sound changes a lot. We try and focus on five to six songs at a time, and to take the time to do 12 songs would probably be a bit more taxing. We’re always trying to keep ourselves up to date. Julie Bozek: I think, with the style of music we like to play, that we focus more on building a song in multiple layers and parts. That’s more important to us than having multiple songs. We prefer to focus on songs that have more depth to them. I’d rather put out a few quality songs than force ourselves to put out a lot of them. MH: Because our sound is evolving a lot, now I feel that we’re in a good place where our music is going. We could focus on an album of 10-12 songs but the turnaround rate with EPs is good for us. JB: Who knows what the future will bring? RD: It’s a different approach with each of you writing songs in small batches. MH: Each EP also captures us where we are musically at a certain point in time. RD: Speaking of evolving, the band has gone through a couple changes over the past few years since you started out in 2011. I remember when you guys were called “The Adventures Of” and then you changed the name because of Facebook tagging and there was a band from England that had the same name. RD: You both were annoyed by that so the name got changed to “Cat Has Claws.” Buck St. Thomas is currently in the folk act O.B. Howard, he used to be the drummer in the band and now it’s just the both of you. How did the adapting come into play when it came to maintaining a similar sound after Buck left? MH: Buck’s style definitely influenced us and we worked really well with him and we love him. Unfortunately our schedules conflicted and we couldn’t have him in the band anymore, but you can still pick up hints of Buck on the drums. JB: What was really cool was that Buck wasn’t a trained drummer so he did a lot of building of drum tracks on his own digitally. We learned from his style of building and incorporated that, with us learning how to build drums. At first it was definitely a challenge but a cool one and then we were like “Okay, we can do this.” Matt learned a lot about drum tracks and building them and it made us able to get our sound more hammered in together for the electronic thing. MH: It’s nice being able to adapt to the drums on the fly between how our songs are going. Even if we’re just playing a song and there’s the same drum track being played every time we play live, we’ll go in and tweak it afterwards. I’ll change it and the next time people hear us, the drums might be a little different. JB: It’s fun to be able to create drums during the evolution of how a song happens. We’re now getting into buying some drum machines so we can start building based on that. RD: Very cool. The both of you are from Cumberland but Cat Has Claws has roots in Attleboro, Mass. 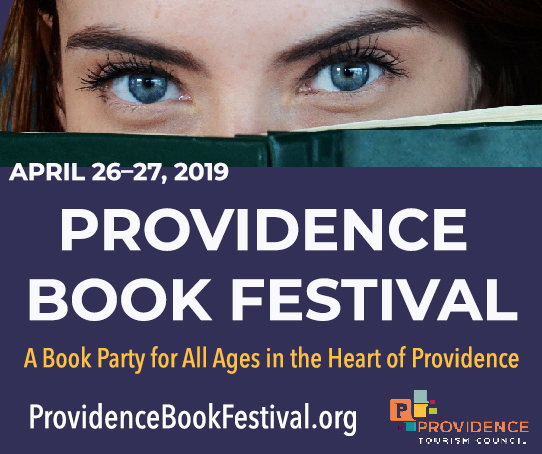 Bands and musicians from the Southern Massachusetts area usually have a few choices to choose from: You start playing shows in Providence or Boston and either you devote most of your time to one city or you even it out between both places. When Cat Has Claws was trying to get established in Providence, what initially gravitated the both of you to this city? MH: I have been playing in bands around Providence since 2008 and so I knew a few places. For one, yes it’s kind of closer and more convenient, but I just like the community in Providence a little more. The scene is more welcoming, and we’ve grown musically as the scene around here has grown, and we’ve been woven into the fabric of what’s going on in the city at this point. MH: It’s got a nice “home” vibe to it. JB: Yeah, so we just felt that it was a natural fit over time and we felt that people here are good people for us. 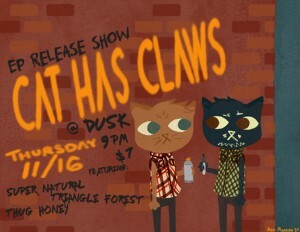 RD: After the EP release show at Dusk, what does the rest of the year have in store for Cat Has Claws? MH: We’ve got a show in Boston on Nov 19 at The Plough & Stars and, after that, we don’t have any other plans as of now. We might try to work on writing, rethink what we’re going to do and move from there maybe for the spring. If any shows come up over the next few months we might hop on some bills or whatnot. JB: We’re going to wait and see I guess. Just like one of the songs on the new EP (laughs), no pun intended. MH: The idea would to start playing down the coast and getting into different cities. Doing that takes a few months and since we haven’t had music out that kind of sounds like what we are now, it’s tough to try and book and put bills together based on that. We’re going to put the EP out and from there will book a tour in the spring and actually go down to [Washington,] D.C. and up to Portland, Maine.